TIREE: On today’s WeBS count: 3CY Iceland Gull at Scarinish – probably 4-5 here just now. 3 juv Glaucous Gulls involved singles at Sandaig, Traigh Ghrianal and Balephetrish Bay – probably 5-6 here just now. 4 Scaup and 2 Pintail at Loch a’ Phuill (John Bowler). KINTYRE: Two female Hen Harriers today seen from the house – (Redhouse to Claonaig Rd), also flushed 2 Woodcock on the track up to the house (Val Wells). MID-ARGYLL: At Braevallich (Loch Awe) today; 6 Whooper Swans, 1 Goldeneye and 1 Mandarin. Also 5 Woodcock between Braevallich and Ford this evening (Alan Dykes). 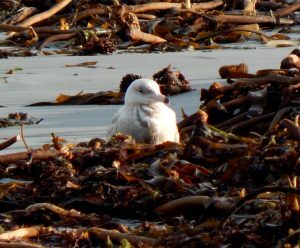 Juv Glaucous Gull – Tiree 22nd Jan (John Bowler).